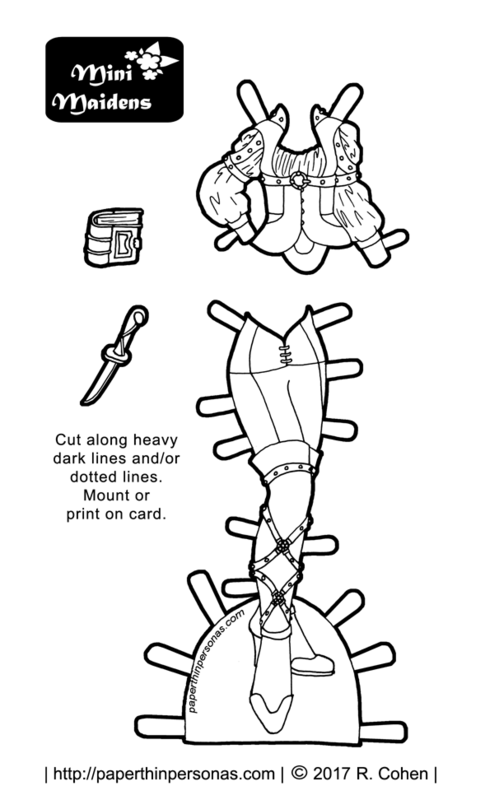 I don’t really know what is going on with today’s printable paper doll clothes for the Mini-Maidens. Is she a pirate? Is she a warrior? Is she just someone who super adores thigh high boots? The possibilities are truly endless. Endless I tell you! This incredible leather bodice with cut outs inspired this whole outfit. The moment I saw it I knew I wanted to draw it. Beyond that, I wanted to do something different with the boots. I draw a lot of boots, but I honestly don’t think I’ve ever done a strap pattern like this before. Because I didn’t want the bodice to overshadow the boots, I treated the straps as almost jewelry. That’s why they got the elaborate studding detail and the fancy clasps on them. So, let me know in a comment what you think of today’s paper doll clothing to color. It’s one of my favorite sets. Meanwhile, if you need more boots and leggings for the Mini-Maidens than pop over here or here or here. Also, this set works, too. Man, I do have a fondness for leggings and boots. I never noticed how many I have drawn. This looks like a Renaissance interpretation of a pirate. Or a fancy Robin Hood figure. No matter what it is, it’s awesome! I think if I were still a librarian I would totally wear that to work. (Without the dagger, though. Wouldn’t want to break rules.) Paradigm shift! It would be fun.